The clinics formatted with a Strikethrough are done so because I ended up getting in conversations with colleagues during those times about a wide variety of topics that I'll detail here. I also was unable to attend any of the evening performances as I was helping a colleague move to his new house! Many of the links are going to be to the web version of the Guidebook for the 2018 conference. A lot of work was put into the Guidebook for this conference by the IBA Technology and Public Relations Committees. I found myself using it a lot more to look up clinician's bios, remember clinic descriptions, access electronic handouts, and remind myself about what I wanted to see. Jerry Tolson provided us with a list of seventeen commandments for getting your band to swing. As of writing this, his handout was not available online. However, much of it is based off his book published through Kendor. None of the information was really new to me, but it got me thinking about how I teach swing in my jazz ensembles. As a vertical PLC, we have decided to use takadimi and solfege as our means of teaching rhythmic and tonal literacy, respectively. By having a uniform system K-12, we find that our students are much more literate in the higher grades than they were prior to this system. I believe having a uniform system of jazz articulation would help us in a similar fashion. This was by far my favorite clinic of the conference. Again as of the publishing of this post, the handout was not yet available. While I wouldn't say I need help interpreting a drum set part or knowing what my drummer needs to play in a given chart, the way Brian Zeglis explained and demonstrated throughout his clinic was excellent. These units made me feel much better about how I rehearse. I typically reserve selecting soloists and backgrounds until much later in the process. It also makes a great deal of sense to me (now) to use the first 50% of rehearsals to really deal with the form of the piece, then come back and deal with the intros, endings, and transitionary elements. Likely the concepts happening in the third unit are similar in nature to things covered in the first two. This is the biggest thing I wish I could implement with a band next year. I was interested in Aaron Perrine's clinic because my Symphonic Band played his Tears of St Lawrence this year, and the kids and I loved it. He did not have a handout, but instead, worked through a presentation on how he interprets textures and timbres in his own compositions. He also had video clips of interviews with composer Joni Greene and conductor Emily Threinen (University of Minnesota). I will definitely be checking out some of Joni Greene's compositions. I think my largest take-away was from one of the interviews with Dr. Threinen when she admits that early in her career, she struggled to discern the mid-voices when listening to wind band. In order to rectify this, she would make sure to isolate those voices (euphonium, horn, trombone, tenor sax, etc.) in rehearsal to not only draw the ensemble's attention to them, but to better train her ear to hear those timbres. I also am intrigued by Aaron's statement that he "hears in timbre," meaning he orchestrates right away as he's writing at the piano. He has very few piano reductions because he doesn't compose that way. I am working as a conductor to better "hear" the timbres in my mind as I read through a score. I can do it with individual instrument lines, but I don't know that I can hear textures of multiple instruments very well. Her students use the Tonal Energy app to tune. I love this app! I just with it was more affordable for students and available on our students' Chromebooks. She has the tuba set the tuner to A438 because she finds that the ensemble will continue to creep sharp throughout a rehearsal or performance. Principal players (those with the best tone) "plug in" to the tuba sound at a slightly softer volume. When principal players are in tune, the remaining players "plug in" to their principal player's sound at an even softer volume. Voices that are playing for others to "plug in" to must provide a loud enough pitch so that the other voices can play softer and still get a good tone. Principal players must play "with good tone, good wind, and in tune" for lower players to "plug in." The choirs, separately or together, would play a chord of her choosing. Then she would hold up a 1, 3, or 5 to cut that particular member out of the chord. She would typically use this to tune and balance the 5th, then the root, then the 3rd. This also works on the correct balance within the chord. Throughout this exercise, she asks her percussionists to organize equipment and music for the rehearsal. Another point she continued to hammer home was the director AND students knowing the pitch tendencies of their instrument. She referenced Scott Rush's The Evolution of a Successful Band Director as a resource, as well as her clarinet and percussion pitch tendency exercises (adaptable to other instruments). Intonation was a big focus for me with my ensemble this year. How can I make them more aware of their pitch and how to adjust it? I believe we were much more successful than in previous years, but I think some of her exercises will make it even better. I love to hear Bob Washut topic about any topic, really. He did not stick to his handout, but instead spent time philosophizing about topics covered in the Resources and Activities section of the handout. I particularly liked his paraphrasing of Jamey Aebersold's thought, that if he could do it all over again, Jamey would start with students learning melodies by ear. Bob modeled several different exercises from his handout about sing/finger/play, "tasting" the note on your instrument, and transposing the licks through multiple key centers. I saw several connections between how he was advocating for teaching improvisation and how Mike Steinel was in our class at VanderCook, specifically around first embellishing melodies. Similar to other clinics this year, there wasn't a lot of new knowledge of nuggets I took away, but instead was prompted to think about the how of my teaching. Ryan Meyer and Tom Cronin of Harlan detailed their procedure of creating "lead sheets" for their 5-8th grade band students. Their handout explained their process and provided examples from repertoire they did this year. I have definitely used this concept before, and it ties in nicely with the small ensembles I did in my concert band. Again, there wasn't a whole lot of new takeaway here, but it made me think about how I could use this technique more often in both my concert and jazz band rehearsals in the future. Brian Covey was unable to make it, as his wife had their child right before the conference! Instead, Scott Casagrande presented on how his program works at John Hersey High School in Arlington Heights, Illinois. He uses his three concert bands to teach fundamentals of performance using resources like Foundations for Superior Performance and Mayhew Lake's transcriptions of 16 Bach Chorales. 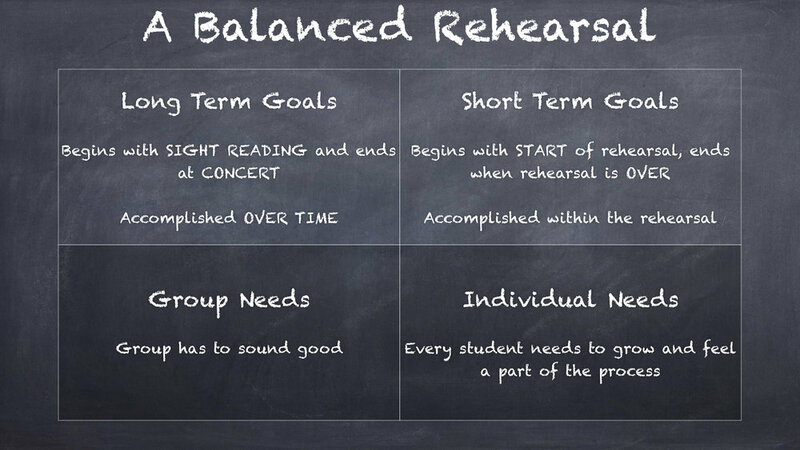 The fundamentals he listed out reminded me of similar lists found in Scott Rush's Habits of a Successful Band Director or David Vandewalker's Foundations for Wind Band Clarity. He uses this core fundamental work in his concert band so in his other ensembles (marching band, jazz band, pep band, etc. ), he can focus on the specifics of each of those ensembles. The point where I disagreed with him was when he said that 100% of the students in his top concert band study privately. While I do believe that focusing on fundamentals in his concert bands is developing his students, I don't think he can attribute his success solely to that when so many of his students are able to study privately. Guided by the idea that large ensemble rehearsal can be a medium for improving individual musicianship, this session hopes to help teachers find ways to encourage the growth of individual musicians. From her handout, you can see some of her philosophy of how to structure a rehearsal based on how her private trombone teacher structured her lessons. This was another clinic that did not have a whole lot of new learning for me, but instead continued my thinking about structure of my rehearsals and use of fundamentals as a part of that time. Sherrie Mericle gave a whirlwind tour of the fundamentals of playing in a variety of different styles. It was fabulously presented with other artists fleshing out her rhythm section; it was just so much information. She did an excellent job of demonstrating what each limb was doing in each style, and how each moved around the drum set to create the different feels. She had two handouts: Developing a Focused Practice Routine for Drum Set Players and Get Your Rhythm Section to Play With Style. My biggest take-away combined with the other jazz clinics I went to about how I rehearse, specifically my rhythm section. I missed a lot of clinics at this conference, either from talking to colleagues and exhibitors or from helping my own colleague move into his new house. I heard great things about the clinics Richard Saucedo gave (you can see the clinics in his bio link). My colleagues also attended clinics like Building an Instrument Replacement Plan, Analogy of the Band Director's Job... the CEO Approach, and performances by groups like the Northwestern College Symphonic Band, the All-State Jazz Bands, the Cedar Falls High School Jazz Band, the Des Moines Symphony Winds, the Grinnell High School Concert Band, the Oak Ridge Middle School Band, the Linn-Mar High School Concert Band, the University of Northern Iowa Wind Ensemble, or the All-State Jazz Conductors Combo. Keynote: Bands in the 21st Century - I am bummed to have missed this, but I was on the phone with our moving company getting ready to pack up our place in Ames. Dr. Paulnack did not have a handout. Putting the Pieces Together: Programming Repertoire for the 21st Century Music Student - Unfortunately, Dr. Stewart fell ill and did not make it to present. And who doesn't love a good session on literature? Eye-Brain Coordination in Music Comprehension - I am fascinated by this research, but my colleagues and I got into a discussion about the national arts standards and how they fit with standards-based grading prior to this clinic. We spent much of this hour discussing our options in a standards-based world moving forward. What the Feedback? Conversations about Standards in Instrumental Music - I was also really interested in seeing how standards-based grading is working for Michael Young and Wendy Morton in the College Community School District, but we were continuing our discussion on standards-based grading and heading to help our colleague move. The biggest take-away from the learning and thinking I did at IBA this year, is what am I prioritizing in my rehearsals? How am I using fundamentals in rehearsals and lessons to solidify my students' playing? How am I using our time together to establish the concepts they need to be independent musicians?